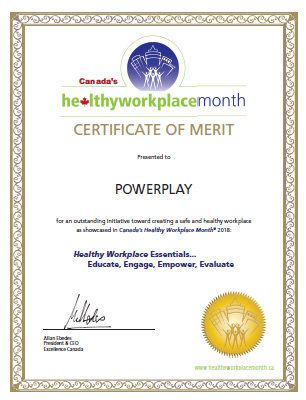 POWERPLAY received a 2018 certificate of merit for an outstanding initiative toward creating a safe and healthy workplace in Canada’s Healthy Workplace Month 2018: Healthy Workplace Essentials…Educate, Engage, Empower, Evaluate. POWERPLAY is featured on Canada’s Healthy Workplace Month here: http://healthyworkplacemonth.ca/en/showcases (click on POWERPLAY in the list to see details). See the full article online, written by Shannon Linden for Kelowna’s Daily Courier. 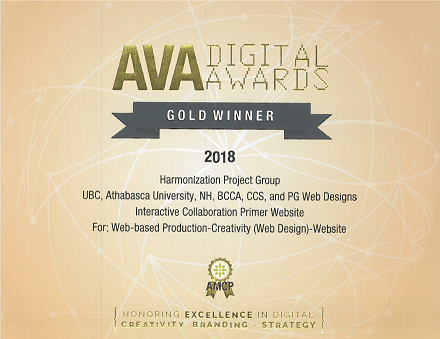 The Online, Interactive Collaboration Primer Wins Gold in the 2017 Ava Digital Awards! The online, interactive collaboration primer (https://www.collaborationprimer.ca) has received gold awards in both the Creativity (Web Design) and Pro Bono categories of the Ava Digital Awards. The Ava Digital Awards are an international competition that recognizes excellence by creative professionals in digital communications. 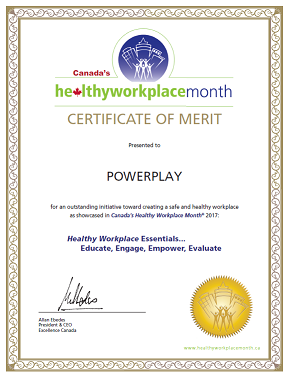 POWERPLAY received a 2017 certificate of merit for an outstanding initiative toward creating a safe and healthy workplace in Canada’s Healthy Workplace Month 2017: Healthy Workplace Essentials…Educate, Engage, Empower, Evaluate. POWERPLAY is featured on Canada’s Healthy Workplace Month here: http://healthyworkplacemonth.ca/en/showcases (click on POWERPLAY in the list to see details). The Online, Interactive Collaboration Primer Wins Platinum in the 2017 dot.COMM Awards! 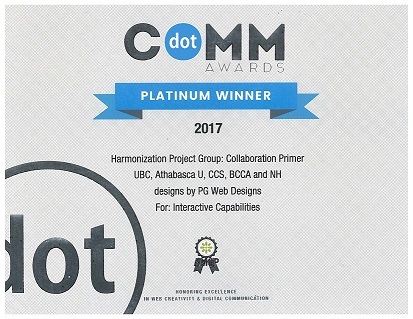 The online, interactive collaboration primer (https://www.collaborationprimer.ca) has received a Platinum award in the Interactive Capabilities category of the dot.COMM Awards. This award honors excellence in web creativity and digital communication. 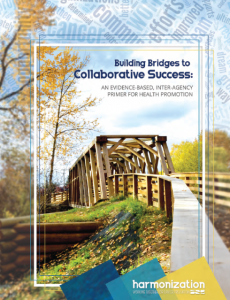 The Harmonization Project Team, including the Canadian Cancer Society, BC Cancer Agency, Northern Health Authority, University of British Columbia, Athabasca University, and designs by PG Web Designs received an Award of Distinction in the Communicator Awards in the category Marketing/Promotion – Design Features-Overall Design for the Collaboration Primer – Building Bridges to Collaborative Success (collaborationprimer.ca). See the Collaboration Primer featured in the winners gallery here: http://www.communicatorawards.com/winners/list/?event=1012&category=1915&award=9&_p=3 (search for Harmonization). 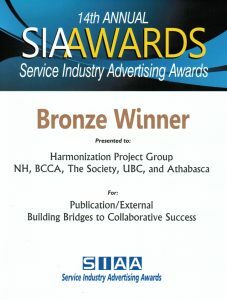 The Harmonization Project Team, including the Canadian Cancer Society, BC Cancer Agency, Northern Health Authority, University of British Columbia, Athabasca University, and PG Web Designs received a Gold Healthcare Advertising Award in the category Other: Misc collateral, Special promo for the Collaboration Primer – Building Bridges to Collaborative Success (http://www.collaborationprimer.ca). 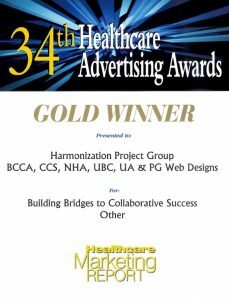 See the Collaboration Primer featured in the winners gallery here: http://healthcare-advertising-awards.com/winners-list/winners-list-2017/ (search for Harmonization). The Healthcare Advertising Awards is the oldest, largest and most widely respected healthcare advertising awards, sponsored by Healthcare Marketing Report. The awards recognizes outstanding work and creative inspiration. 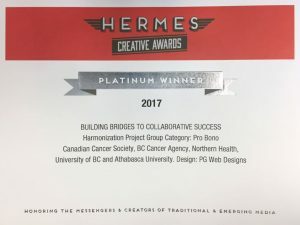 The Harmonization Project Team, including the Canadian Cancer Society, BC Cancer Agency, Northern Health Authority, University of British Columbia, Athabasca University and designs by PG Web Designs received two Platinum Hermes Creative Awards of excellence in the categories of Publications – Other – Primer and Pro Bono for the Collaboration Primer (https://www.collaborationprimer.ca). 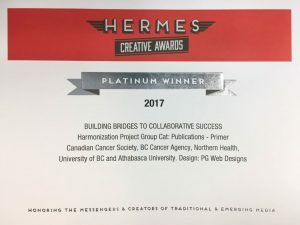 See the Collaboration Primer featured in the winners gallery here: https://enter.hermesawards.com/winners/#/platinum/2017 (click on “H” for Harmonization Group). The Hermes Creative Awards are International awards honoring creative excellence for professionals involved in the creation of emerging and traditional media. The Collaboration Primer was also a Bronze winner of a Service Industry Advertising Award in the Publication/External category. 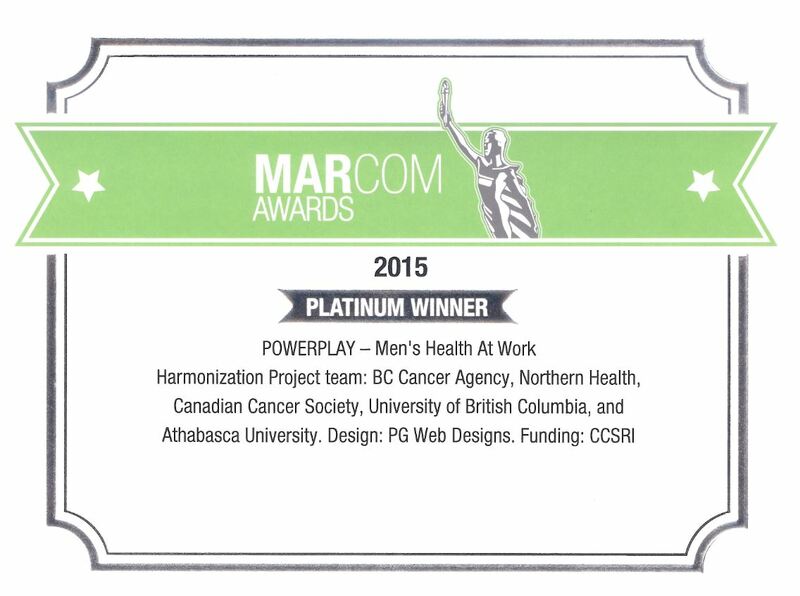 The Harmonization Project Team, including the Canadian Cancer Society, BC Cancer Agency, Northern Health Authority, University of British Columbia, Athabasca University and designs by PG Web Designs received a 2016 award of excellence in the Print category (Public Service/Pro Bono sub category) of the 22nd Annual Communicator Awards for POWERPLAY – Men’s Health at Work. See an image of the playbook featured in the winners gallery here: https://www.communicatorawards.com/winners/gallery/?id=39035. The team also received a 2016 award of distinction in the Print category – Marketing/Promotion – Campaign sub category. The Communicator Awards are International awards honoring creative excellence for communications professionals. POWERPLAY was also a platinum winner in the Public Relations category of the Hermes Creative Awards for POWERPLAY – Men’s Health At Work, and a platinum designation in the Pro Bono category. The Hermes Creative Awards are an International competitions for creative professionals. POWERPLAY wins a Service Industry Advertising Award! 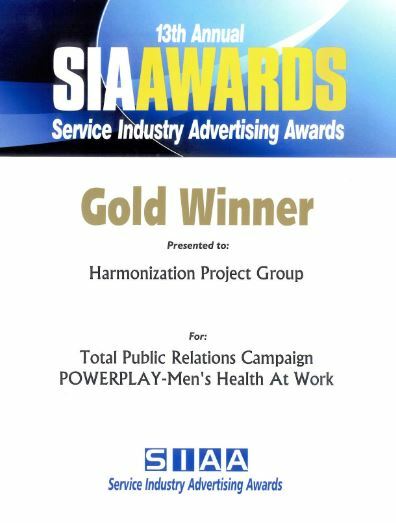 The Harmonization Project Group, including the Canadian Cancer Society, BC Cancer Agency, Northern Health Authority, UBC and Athabasca University, and Designs by PG Web Designs, was a Gold winner in the “Total Public Relations Campaign” category of the 13th Annual Service Industry Advertising Awards for the Men’s Health at Work Program, POWERPLAY. Beginning April 15, 2016 and supported by a collaboration for health research in northern BC seed grant, a new mental wellness program, Head Strong, for men in northern and rural workplaces is being created. The Head Strong module will be designed to appeal to northern men and to support the well-being of employees working in a variety of diverse settings. The NEW team that will be leading the development of this module includes Dr. Cherisse Seaton (NPI, UNBC), Kerensa Medhurst (Co-PI, BCCA), Damen Deleenheer (Co-PI, Northern Health), Dr. Joan Bottorff (Co-I, UBC), Dr. John Oliffe (Co-I, UBC), and Margaret Jones-Bricker (Co-I, CCS). Nancy Viney from the SSBS team attended the 8th Annual Ottawa Conference State of the Art Clinical Approaches to Smoking Cessation January 23, 2016 with a poster and 2 minute, 2 slide presentation titled Implementing a Systematic Approach to Addressing Tobacco Before Surgery: Experiences from the Stop Smoking Before Surgery Program. Pictured by the Stop Smoking Before Surgery poster and table display is Dr Peter Selby, Chief of Addictions Program and Clinical Scientist at the Centre for Addiction and Mental Health along with Cheryl Connors, Executive Director of the Canadian Network for Respiratory Care. The POWERPLAY “Men’s Health at Work” program wins a Cancer Awareness Advertising Award. 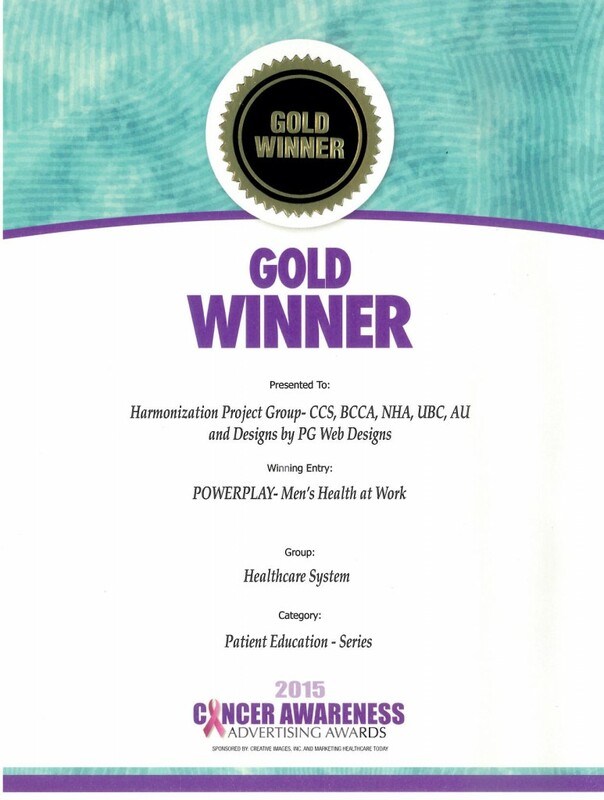 The Harmonization Project Group, including the Canadian Cancer Society, BC Cancer Agency, Northern Health Authority, UBC, Athabasca University (with designs by PG Web Designs) was a 2015 gold winner in the “Patient Education – Series” category of Cancer Awareness Advertising Awards for the Men’s Health at Work program, POWERPLAY. The Cancer Awareness Advertising Awards recognize excellence in cancer awareness marketing and advertising. For the full list of winners, click here. 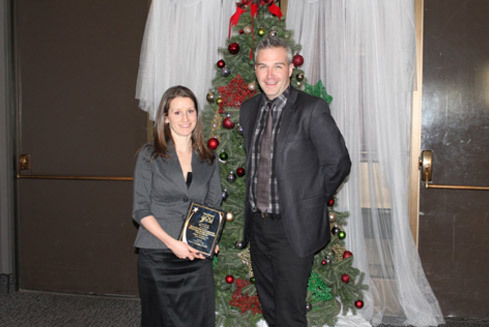 The MHEAL project team, including the Canadian Cancer Society, Northern Health, BC Cancer Agency, University of British Columbia, and Athabasca University received the Healthy Workplace for Small Business award at the Healthier You Awards in Price George Nov 13, 2015 for the POWERPLAY program for northern men. The Healthier You Awards celebrate the groups that have made outstanding contributions towards the health and wellness of the people in northern BC. Depicted is the project coordinator, Cherisse Seaton, accepting the award on behalf of the team. The MHEAL project team including the BC Cancer Agency, Canadian Cancer Society, Northern Health, University of British Columbia, and Athabasca University (with credits to PG Web Designs) was a platinum winner in the Promotion/Marketing Materials category of the International competition for marketing and communication professionals (Mar Com) for the POWERPLAY – Men’s Health at Work Campaign. 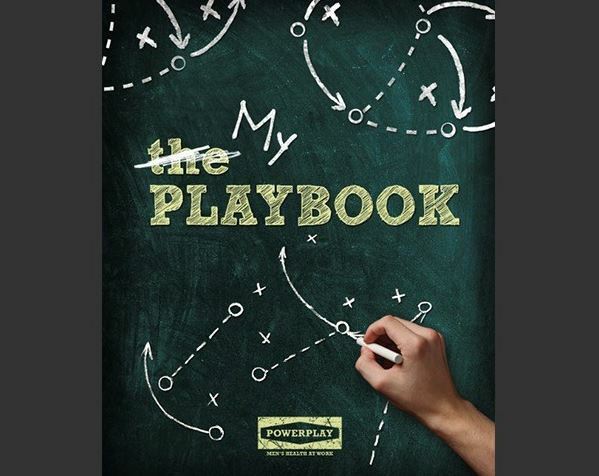 The POWERPLAY Playbook also received a Platinum designation in the Pro Bono category. Mar Com Awards are international creative competitions for individuals or companies involved in the concept, writing and design of print, visual, audio and web materials and programs administered and judged by the Association of Marketing and Communication Professionals. “Gender sensitized” physical activity programs are a key development in men’s health promotion and demonstrate potential for engaging hard-to-reach men. While entry points for engaging men in physical activity were diverse, programs that engaged men through organized sports showed evidence of effectiveness. Programs with a diverse set of components, including online and mobile platforms, may impact the physical activity of men if the approach is simple, clear, and tailored to men’s interests and preferences. Kerensa Medhurst, Health Promotion Coordinator for the Northern Region of the Canadian Cancer Society, talks about the POWERPLAY Program on CKPG News. 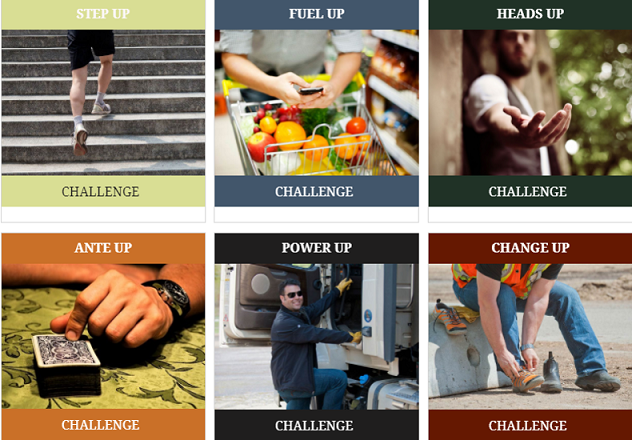 The POWER PLAY program begins its next six-week healthy living challenge today with a focus on healthy food choices and physical activity outside of the workplace. The PLAYOFF challenge builds on what the participants have already learned and accomplished over the first six weeks and encourages each man to set new goals for himself. Launched in fall 2014, the first of two six-week interventions focused on getting men moving by challenging them to walk the Great Northern Circle Route and keep track of their steps. Employees of Excel Trucking, Lomak Bulk Carriers Ltd, the City of Terrace, and Ridley Coal Terminal participated in the first challenge. In the next challenge, they will earn points for each healthy eating choice they make, as well as the time they spend engaged in physical activity outside of work. These points will translate into goals and ice time as men compete in the PLAYOFF hockey challenge. View the full PDF news release here. For more information on POWERPLAY, visit: www.facebook.com/powerplayprogram. This video is part of the Stop Smoking Before Surgery program, an initiative of Harmonization: Leading Cancer Prevention through Sustainable Partnership. The purpose of this review was to update the review undertaken by George et al. (Sports Med 42(3):281, 30) concerning the effectiveness of physical activity programs in males, and evaluate the integration of gender-specific influences in the content, design, and delivery of men’s health promotion programs. This open access article can be downloaded here. A new initiative has launched in Northern BC to address health challenges currently faced by men in the region. The program, POWERPLAY, is a workplace wellness-based initiative that will focus on improving healthy eating and active living among men. According to a report published by Northern Health in 2011, Where are the men?, men die an average of five years earlier than women, of almost all causes, both in BC and most of the developed world. In Northern BC, the situation for men is even more critical as northern men do not live as long as men in the Lower Mainland of the province. “We have been working on addressing the health needs identified by northern men and recognize that an effective way to do this is to go where they are. Providing men with practical information and peer support in their workplaces can help men make positive lifestyle changes to improve their health and avoid illness.” – Holly Christian, Regional Lead for Men’s Health, Northern Health. Electronic medical records and health records systems have the potential to improve the quality of care and improve health outcomes. Specific fields can cue health care providers to discuss patient centred issues to promote health and reduce the incidence of chronic disease. Patients who use tobacco and are planning to have surgery should be aware of the benefits of quitting before surgery. Tobacco specific questions have been added to the SurgiNet system for UHNBC. These questions will ensure that all patients are screened for tobacco use and all smokers are informed of the benefits of quitting and linked to the provincial cessation services prior to their surgery. Have you used any tobacco products in the last 6 months? Are you aware that stopping smoking before surgery lowers the risk of surgical complications and improves healing? Have you been referred to Quitnow and HealthLinkBC 8-1-1 for provincial smoking cessation services? Debi Lyn, a cancer survivor from northern B.C., shares with you her experience of being a smoker and going through surgery. In this video, Debi encourages you to use your surgery date as a motivation to quit smoking before surgery. Stopping smoking eight weeks before surgery reduces the risk of complications, lowers the chance of infection and shortens hospital stays. A new initiative known as Stop Smoking Before Surgery is looking to increase awareness of the benefits of smoking cessation prior to surgery as well as to support patients in their decision to stop smoking. This video clip, which aired on CKPG News, highlights the Stop Smoking Before Surgery Program (SSBS). SSBS is a collaboration between Northern Health, the Canadian Cancer Society, and the BC Cancer Agency that is seeking to raise awareness about the benefits of quitting smoking prior to surgery while also providing the tools to help do so. In this edition of A Focus on Our People, Cathy Ulrich, Northern Health’s chief executive officer, is excited to share Northern Health’s involvement in Stop Smoking Before Surgery – a joint initiative with the BC Cancer Agency and the Canadian Cancer Society. 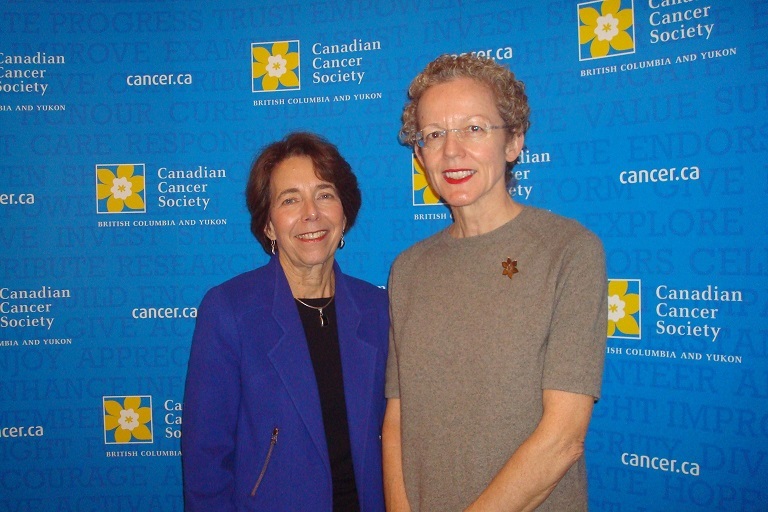 Cathy speaks with Nancy Viney, Dr. Nadine Caron, Jenn Brookes, and Kristen Morey about this initiative that is funded by the Canadian Cancer Society Research Institute. PRINCE GEORGE – As B.C. recognizes Weedless Wednesday – part of National Non-Smoking Week – smokers are offered helpful tips from the northern medical program and the Stop Smoking Cessation Program to make quitting easier. Go to the BC Ministry news page, for more news releases. The BC Health Minister, Terry Lake spoke about smoking cessation Wednesday Jan 22, 2014 at UNBC. Posing with two medical students (left), are Virginia Dekker and Nancy Viney of Northern Health (centre), and Minister Terry Lake, and Dr. David Snadden (right). BC’s northern Harmonization Project is launching a new initiative to help surgery patients in northern BC quit smoking before surgery and to stay smoke-free in the long term. Stop Smoking Before Surgery, available on QuitNow.ca gives information about the benefits of quitting, such as fewer surgical complications, a reduced risk of infection post-surgery and shorter hospital stays. 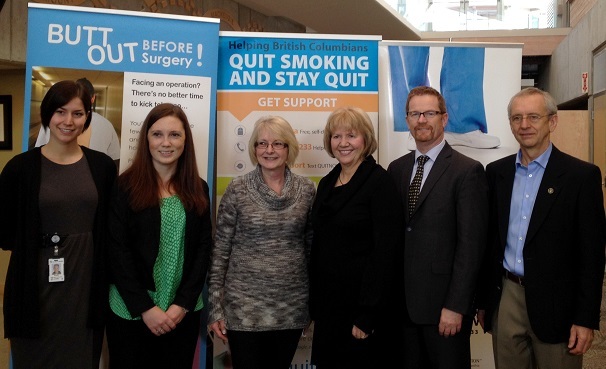 The Harmonization Project, a collaboration between the BC Cancer Agency, Northern Health and the Canadian Cancer Society, is launching the new resources with the BC Lung Association’s QuitNow.ca as part of the Stop Smoking Before Surgery initiative for National Non-Smoking Week, January 19-25, 2014. The first results of a new study under way in Northern BC has shown that approximately half of patients who recently had surgery were not aware of surgical complications related to smoking. 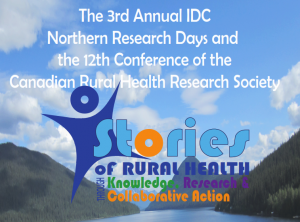 The 3rd Annual IDC Northern Research Days and the 12th Conference of the Canadian Rural Health Research Society: Stories of Rural Health through Knowledge, Research, & Collaborative Action took place Nov 13-15, 2013. 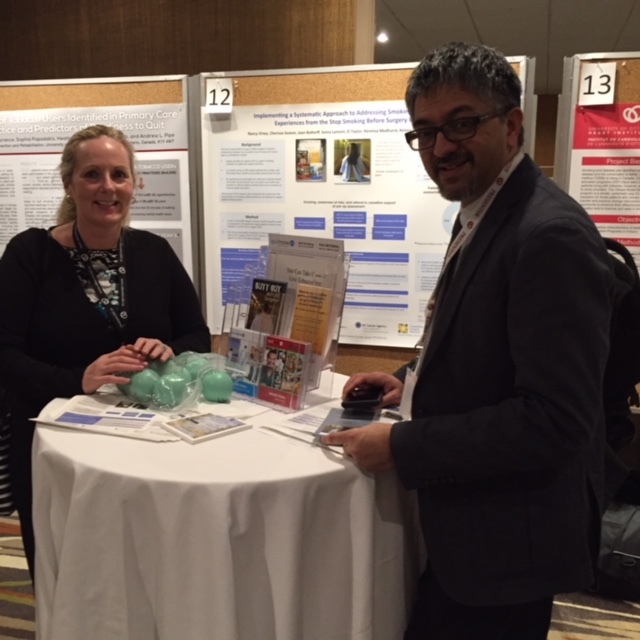 Members of the harmonization team gave presentations about the project at this conference, and a “Stop Smoking before Surgery” table was available with resources for all conference attendees. 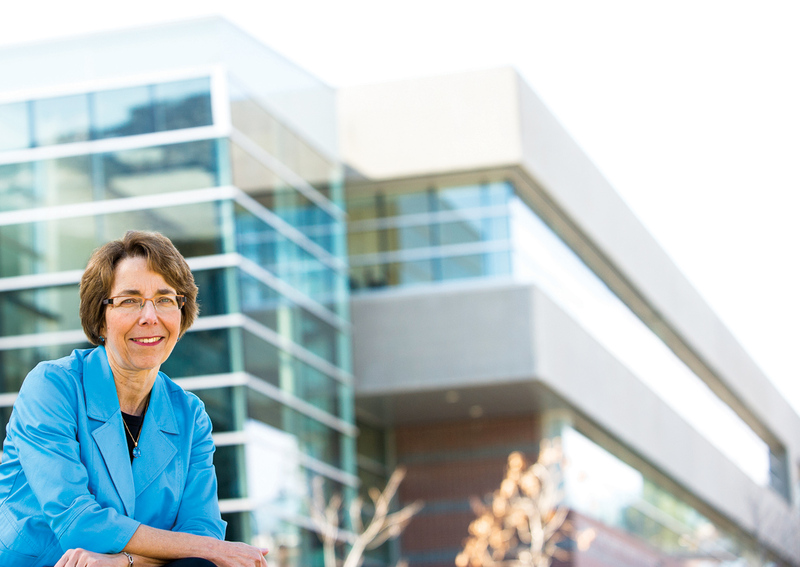 Dr. Joan Bottorff is the Director of the Institute for Healthy Living and Chronic Disease Prevention at UBC Okanagan. With nearly $1 million in funding from the Canadian Cancer Society, Dr. Bottorff and her team are undertaking cancer prevention research that will have an impact on this region’s burden of cancer and will inform how other Canadian regions can deliver similar programs. Through research partnerships such as this your donations are changing the lives of Canadians with cancer. Stop Smoking Before Surgery. You can make a difference in your patients’ lives. What are the benefits of stopping smoking before surgery? Smoking cessation 6-8 weeks prior to surgery is ideal; however health care professionals can encourage patients to be smoke free any time before, during, and after surgery to improve health outcomes. The presentation and research team included partners from the Canadian Cancer Society, Northern Health, and the BC Cancer Agency, along with researchers from the University of British Columbia and Athabasca University, who will work together to design, deliver and evaluate two cancer prevention projects. 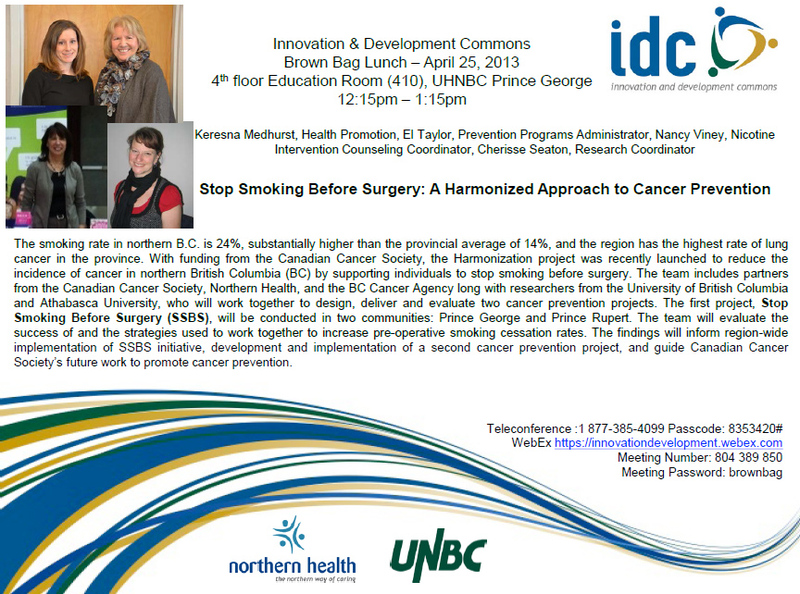 The first project, Stop Smoking Before Surgery (SSBS), will be conducted in two communities: Prince George and Prince Rupert. The team will evaluate the success of and the strategies used to work together to increase pre-operative smoking cessation rates. Request a presentation on our Stop Smoking Before Surgery research and rollout. Our team members are available to present to your community, health promotion team or to staff wellness sessions. With nearly $1 million in funding from the Canadian Cancer Society, researchers at the University of British Columbia and Athabasca University are collaborating with health-care agencies to target cancer prevention strategies in northern BC, where cancer incidence rates are the highest in the province. Partners include the Canadian Cancer Society – BC and Yukon Division, the BC Cancer Agency, and Northern Health. Researchers take collaborative approach to disease-prevention strategies. Harmonizing cancer prevention services will have an impact on the North’s burden of cancer and will also inform how other Canadian regions can deliver similar programs. The Challenge: Due to the large size of the northern region and its dispersed populations, delivering cancer prevention services is challenging, making it difficult for any one organisation to have a significant and lasting impact. “We need to continually work together to ensure are providing strong and unified services to northerners, and our collective impact on this work moves us in the right direction.” Lucy Beck, Regional Director, Public health protection, Northern Health Authority.